Citing harassment in the workplace and a hostile environment, this negative resignation letter hints at legal action after departure. 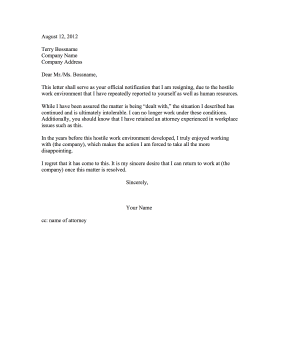 This letter shall serve as your official notification that I am resigning, due to the hostile work environment that I have repeatedly reported to yourself as well as human resources. While I have been assured the matter is being "dealt with," the situation I described has continued and is ultimately intolerable. I can no longer work under these conditions. Additionally, you should know that I have retained an attorney experienced in workplace issues such as this. In the years before this hostile work environment developed, I truly enjoyed working with (the company), which makes the action I am forced to take all the more disappointing. I regret that it has come to this. It is my sincere desire that I can return to work at (the company) once this matter is resolved.